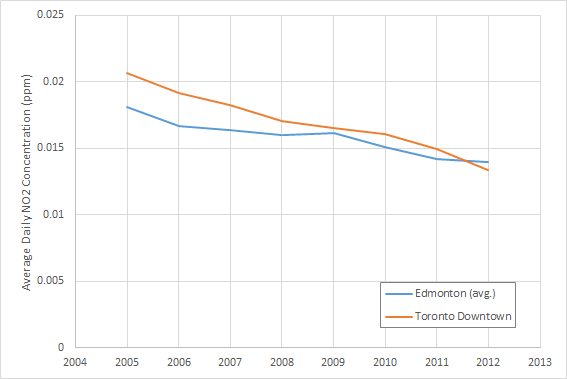 This morning, I read an Edmonton Journal article that claimed that Edmonton's air quality was worse than Toronto's, even though we have five times less population than Toronto. The article's subtitle reads: "Particulate readings 25 per cent higher on some winter days." I'll admit that my initial reaction to this was skepticism - the language used in the article seemed pretty wishy-washy and I wasn't sure what all the fuss was about. It's not terribly unnatural for some days in some cities to be worse than some days in other cities. Also, if pollution levels are particularly low on certain days, being 25% higher than another city is pretty easy and still reasonably healthy. So I decided to look into the numbers a little bit more. The article continues, saying "pollution from particulate matter exceeded legal limits of 30 micrograms per cubic metre at two city monitoring stations on several winter days in 2010 through 2012." Ok, that sounds pretty bad, but what do these limits correspond to, and how bad is "several", really? First of all, let's take a look at what makes air unhealthy. The Air Quality Health Index used by Environment Canada looks at three factors: Ozone at ground level, Particulate Matter (PM2.5/PM10), and Nitrogen Dioxide. Exposure to Ozone is linked to asthma, bronchitis, heart attack, and death (fun), nitrogen dioxide is pretty toxic, and particulate matter less than 2.5 microns is small enough to pass right through your lungs and play with some of your other organs. These aren't things you really want to be breathing a whole lot of. The AQHI for Edmonton today is a 3 out of 10, considered ideal for outdoor activities, but at a 10 out of 10 level people are pretty much encouraged to stay inside and play board games. The report in the Journal article referenced PM2.5 only, which is particulate matter that's smaller than 2.5 microns. The maximum allowed levels for PM2.5 in Alberta are 80 micrograms per cubic meter (ug/m3) in a single hour, or 30 ug/m3 over a day. According to the Journal article, these levels were exceeded "several" times between 2010 and 2012. How many is several? I don't know about you, but exceeding government safe levels for air quality on one day out of every eleven in 2010 is not what I'd call "several." 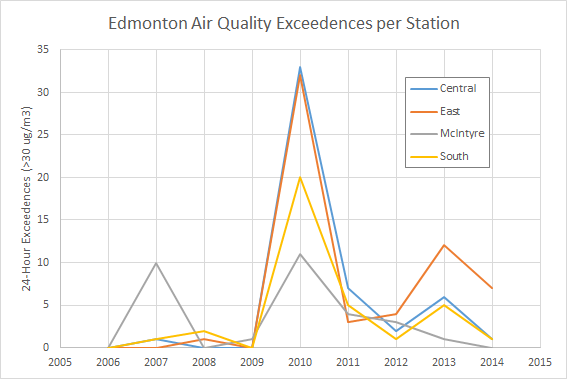 There was over a combined month of air quality limits being broken in 2010 in central and east Edmonton. That's... not even close. 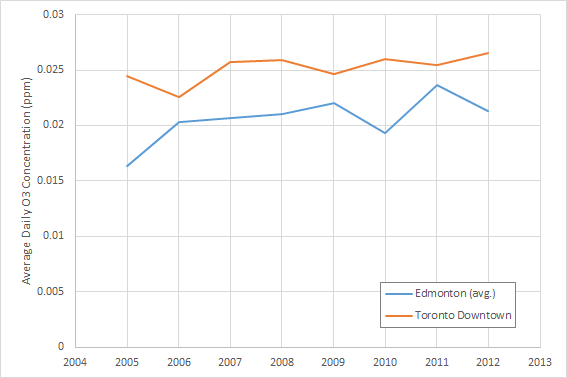 Edmonton was 25% higher than Toronto for pretty much all of 2012, not "some winter days." This is enough to make me feel like perhaps the sources referenced in the Journal were using different data, or perhaps I'm mistaken, but the sources I used are all publicly available and I encourage you to check them out yourself. 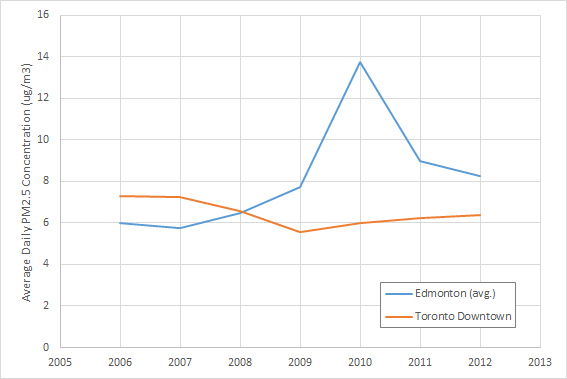 Again, these levels are much safer than the particulate levels were, and in general Edmonton is about the same or slightly better than Toronto for these indicators. So all in all, I started out today thinking the article was being alarmist, if vague, and I've ended up thinking that it's well-meaning but presented oddly. Edmonton definitely does seem to have a problem with one of the major indicators of air quality, and if it takes a city-pride fight with Toronto to get that sorted out, so be it. Did you take a look at ESRD's data for air quality monitoring? They seem to have different numbers than CASA, which is odd. sử dụng nhiều loại máy ozone công nghiệp vào trong các ngành công nghiệp là thế mạnh. Với các ngành công nghiệp sản xuất, máy ozone công nghiệp đã thể hiện được sức mạnh. tiện dụng chủ yếu khí ozone là khử sạch, làm sạch không khí, từ đó đem lại những giá trị thiết thực nhất dành cho đời sống hiện đại. Dĩ nhiên, lợi ích nó đem lại là rất to lớn giả dụ tính trên nhiều tương tác máy. Có lẽ máy ozone trong công nghiệp chính là loại máy cần trang bị cho các dây chuyền lọc nước ăn uống, lọc nước tinh khiết tốt nhất ngày nay. Andatphat là địa chỉ mua máy ozone công nghiệp uy tín nhất trên thị trường hiện nay.